This Sunday, March 6th, I’ll be speaking on Jane Austen and Edith Wharton at a meeting of the Nova Scotia Region of the Jane Austen Society of North America. It starts at 2:30pm; please email me (semsley at gmail dot com) for the location and directions if you’re in the Halifax area and would like to attend. My talk compares Austen’s Lady Susan and Wharton’s Undine Spragg, of The Custom of the Country. Both flirtatious, manipulative heroines (or anti-heroines) delight in their power over a series of both eligible and married men, and both are constantly in search of what Undine thinks of as “something still better beyond.” Both would agree with Austen’s Mary Crawford, of Mansfield Park, that “A large income is the best recipe for happiness I ever heard of,” but it seems unlikely that the social and financial ambitions of either woman will ever be satisfied. At the end of The Custom of the Country, Undine is left to ponder that “Even now, however, she was not always happy. 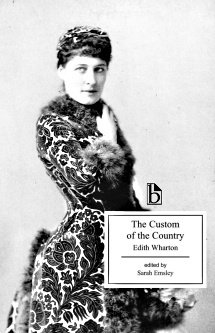 She had everything she wanted, but she still felt, at times, that there were other things she might want if she knew about them.” At the end of Lady Susan, the narrator wonders whether the heroine is happy in her second marriage to a rich aristocrat, and concludes that “The World must judge from Probability” based on her earlier career. Great talk! I enjoyed it in Boston in Nov.